The new styles replace the browser’s HTML form elements with custom vector images. These images display the same across all operating systems and browsers. This helps form owners know exactly how the forms will appear to all users. Besides to the icon display, there is now a small animation added when selecting options. This animation helps to make the choice selection more impactful for the user, especially on mobile devices. Mobile users will also find larger target areas for selecting inputs to enhance usability. 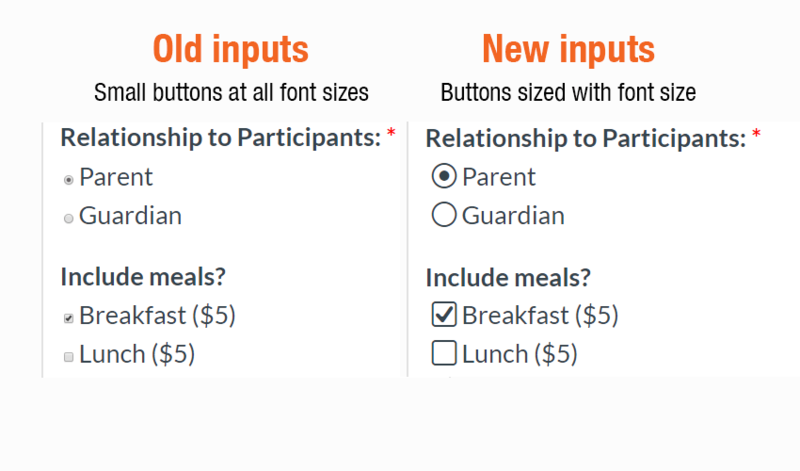 The new inputs appear in all new forms and convert when editing existing forms. Current forms are not modified until the form owner edits the form. Form owners that wish to upgrade existing forms need to log in and edit the form, then the form will automatically switch to the new input styles. The new inputs use the same color as the form’s text and use the font size for sizing. This strategy shows large inputs when the text is large and small inputs for small text.